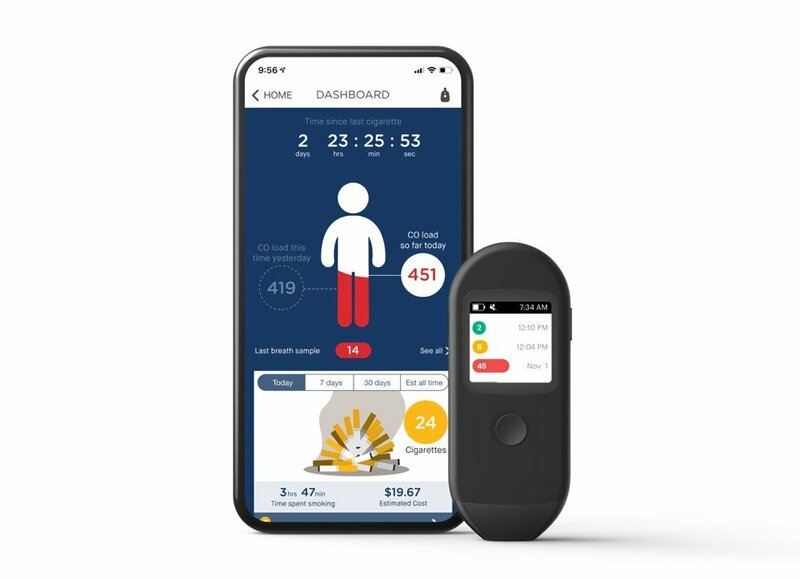 The FDA Just Approved the First Mobile Device and App to Help You Quit Smoking | Carrot, Inc.
A start-up called Carrot just got cleared from federal regulators for its digital approach to help millions of people quit smoking. Part of its program includes the first FDA-approved use of a smartphone app to help people quit smoking. The venture-backed company offers a combination of two things: A mobile coaching program called Pivot and an FDA-cleared carbon monoxide breath sensor for at-home use. The sensor pairs with Bluetooth to a smartphone, so it can track levels over time through an app. “What we’ve really spent time on is developing the first scalable, evidence-based smoking cessation program that can be delivered via a smartphone,” said Carrot’s CEO David Utley, a surgeon specializing in head and neck cancers, in an interview with CNBC. Carrot believes people will be motivated in part by viewing their carbon monoxide levels, which are higher than in nonsmokers. Carbon monoxide poisoning is a major case of death in the U.S., accounting for some 50,000 cases in emergency departments per year. Utley says the app is also meant to help sharing positive messages, rather than admonishing them. And the program is designed to help all smokers, and not just those who are planning to stop for a little while. “We don’t vilify smokers,” he said. Carrot is not the only digital health company focused on smoking cessation, which remains the leading cause of preventable disease and death in the United States. A start-up called Chrono Therapeutics is working towards FDA approval for its wearable quit-smoking system, which delivers nicotine via a programmed patch. Both start-ups are part of an emerging category in the health-technology space called “digital therapeutics.” These companies are working to replace or augment traditional therapies, including pills, through online programs that promote behavior change. These companies differentiate themselves from the rest of the market of activity monitors and smart scales by carrying out clinical tests and seeking regulatory approvals. Employers and other insurers are on the hunt for programs that improve the health and wellbeing of their workforces. Smoking amounts to more than $300 billion in health costs and lost productivity every year. Pivot uses mobile technology, behavioral science, and clinical expertise to help people quit. It really goes without saying at this point that smoking is bad for you. That’s something the majority of us have been hearing that our whole lives.